Fall Fashion- The put together working mom. Today's Fashion Week post is by my BFF, who used to be scared of leggings and is now rocking some majorly cute outfits. A few weeks back Deena asked me to guest post on fashion. My blog started by being totally devoted to my pregnancies and then to my kids, but now that they are a little older and I have a little more time to myself, I've started blogging about fashion here and there. It wasn't something I was ever into, until recently. Considering that I work attached to the mall and throw in all the fashion blogs that I have started to read and all of a sudden following the latest trends has become somewhat of a hobby! I don't claim that I am the most trendy person or that I even have any idea what I am talking about when it come to style. My goal when I get dressed is to feel put together rather than to feel stylish. I don't sacrifice comfort for style either. Except maybe on the odd pair of shoes. As a mom, I can't be bothered with anything that can't be thrown in the washing machine if my kids happen to touch me with their dirty little hands. Ha! So without further ado, here are some of the fall essentials you will find in my closet (and on my shopping list). Let's first address the photos. My face is always covered by the camera. My choice was simple. Wait for my husband (who is terrible at photography) to take the many pictures of me or just do it myself and make the most of it. I chose the latter. I like my outfits to be easy. So you will often see me with a white tee and a necklace or scarf and a pair of skinny jeans. It doesn't require much thought but the accessories make me feel put together and less boring. I prefer a white tee, but using black or grey would work to. They are neutrals that go with everything so you don't have to worry if the colors match or not. It is odd that I choose white since I have all those little dirty hands that are busy pulling on my shirts - but the key is to choose cotton. If I get a stain, I just throw it in the wash and it comes out clean almost every time. My go-to store for cotton basics is Smart Set. They have great sales and the shirts are a little longer which I personally like. Caution! Their Vneck Tees are very deep and show more than I'd like to. Also, remember that Oxy Clean Baby that you used on your kids clothes when they had explosive poop? I use that on my own clothes for those stains on my white T-shirt that are a little stubborn. About 18 months ago, I dived into the world of statement necklaces. Meaning you may choose your entire outfit around your jewelery! That is where the basic tee becomes important because it goes with everything! They can be pricey, but if you shop around you can find them reasonably priced. In all honesty, I have bought most of mine on line. Ebay, Etsy, and SheSteals to name a few. And I know Deena has bought some on Modcloth. For some, that statement necklace may be a little out there, in which case you need to pick yourself up a few scarves. You can make them as crazy or as neutral as you want. Right now I am very into infinity scarves (a scarf that is one big circle and wrap around your neck twice) as I feel you don't have to mess around with them as much to make sure they are in the right position. Right now I love animal print. I have animal print shoes, purse, and scarf. I am starting to get used to wearing animal print as a neutral but pattern mixing doesn't come easy for me. Notice the animal print and stripes combo... yeah me! What I love about fall fashion is the ability to layer. 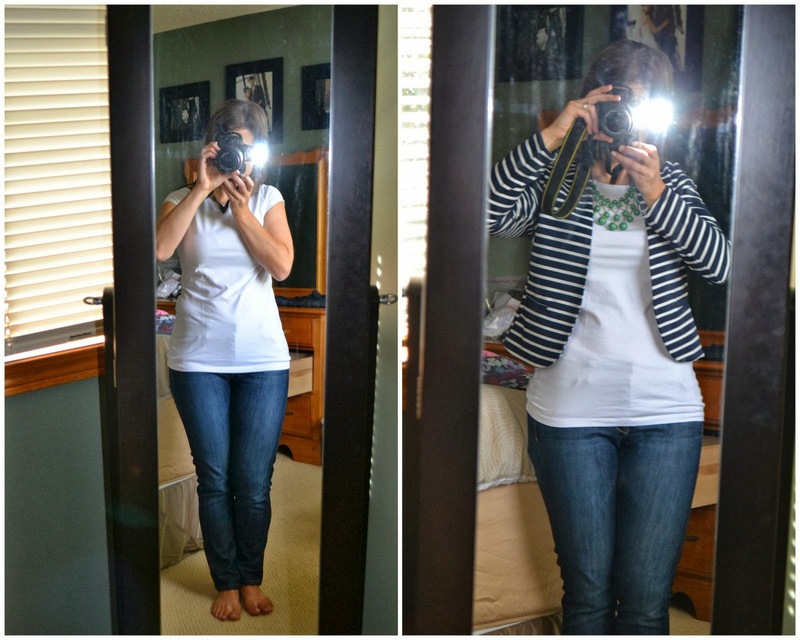 I love throwing on a cardigan or a blazer over the basic tee and jeans to create a little depth. As you can tell from the photos above, I love me some stripes. 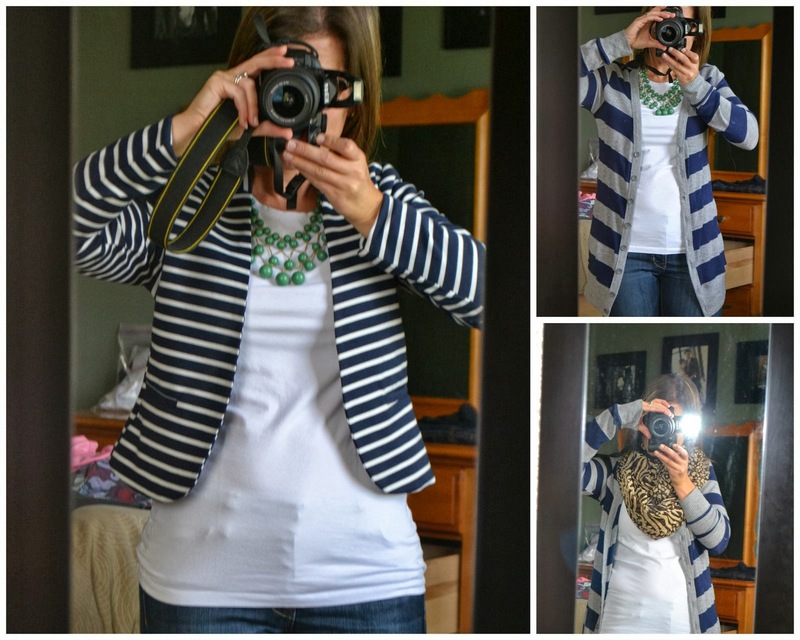 If I were to swap out the striped cardi I would probably go with an orange or yellow one to tie in the animal print. Or cobalt blue, which I don't have but just decided to add to my shopping list. Most recently, I have dived into the world of blazers. If you have read my blog at all I used to hate blazers. I work in the corporate world where every once in a while I need to wear a blazer to work and they always made me feel like a man. This year they have come out with some great blazers, some are collarless, some are printed, and they are all great choices for layering. 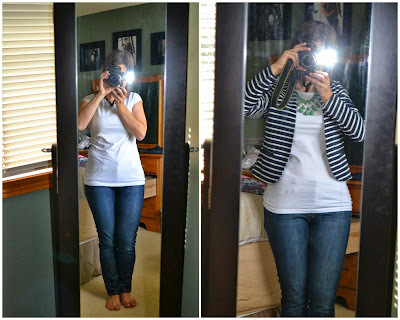 Although I still prefer a cardigan, the blazer are gaining some popularity in my closet. And for the record, when I say patterned I do NOT mean floral (I am talking to you Sara!). Many people are not into floral, and for the most part, neither am I. I have accumulated a few pairs of patterned pants over the past 6 months,which is surprising since I was pretty against them when they first came out. I recently did a post on a great pair of camo pants I scored from the Gap and most recently I bought the above hounds tooth pants from Simons, Deena's most favorite store! Hounds tooth is super in this season and it so reminds me of the clothes my mom wore when I was growing up. It was her absolute favorite pattern. I spotted a pair at Superstore last week which would be a good alternative. I figure anything you can buy at superstore is a neccesity, right?? Again, any patterned pant can be paired with a plain neutral tee and either a scarf or a statement necklace. See below. It turns a pair of pants and tee into an outfit. And a rather cute one if I do say so myself. Personally, I always buy flat-ish boots so I can pull them off with skirts, jeans, and leggings. I've learned the hard way that it is worth it to spend money in the boot department. I bought 2 pairs of boots last winter that were not real leather and just didn't look as great as I knew they could. They are on a list of things to replace this fall. I am headed on a shopping trip with the BFF in just a few weeks where I plan to splurge on a great pair of brown AND black books. SHHHHH, don't tell my hubby! If I had to choose between having a pair of brown OR black boots I would definitely get brown. In the past I would have shyed away from black and brown, but now it is one of my favorite color combos. It is the perfect pop to a plain black outfit or a black dress and a brown belt. It may feel funny at first but I swear you'll get used to it and love it! Let's have a quick chat about booties. I am just not into them. Booties are a hot item this fall and I see them everywhere at the stores right now. I just can't do it. I will keep reading my blogs and maybe next year I'll venture there. What are your thoughts on booties? A pencil skirt is a must have this season. Whether it be for work or a date night with your hubby, you can dress it up or sexify it. Yes that is a word. I just love how with a tucked in shirt it shows off your curves. I still feel a little awkward with my shirt tucked in but I'm getting used to it. And at the risk of sounding like a broken record just add a necklace or scarf and add a cardi and you have a perfectly simple put together outfit. If you can a remember a few simple rules for this fall you'll be looking, and more importantly feeling, put together with minimal effort in no time. 1. Keep the first layer basic. Jeans and plain tee. Just like that, your outfit goes from boring to put together. Simple. Also, I'd like to point out that I am wearing the same white tee in every single outfit. If I haven't convinced you that basic tee shirts are a wardrobe essential then I don't know what will! If you are interested, here are my favorite fashion blogs that I read for inspiration. Love the patterned pants! 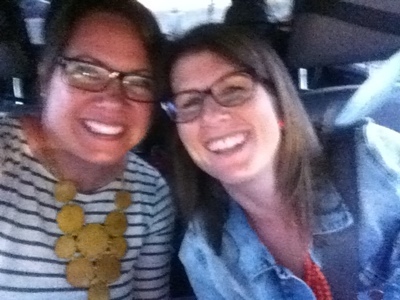 You have also convinced me to go with a white t-shirt and start buying more flashy necklaces and bolder sweaters! I still can't do a scarf! Not sure why, but I feel awkward in them. Great post, Christy!